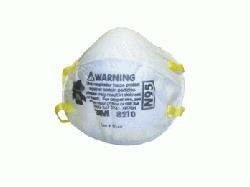 Designed to help provide quality, reliable worker protection against certain non-oil based particles. Its lightweight construction promotes greater worker acceptance and comfort and increased wear time. Workplace applications include grinding, sanding, sweeping, bagging and other dusty operations. This respirator features 3M's Advanced Electret Media (AEM) and an adjustable nose clip to help provide a custom fit and secure seal.